The red of the roses was deep and perfect. Perfectly boring – just like most things that are too pretty. The sepia added a bit of nostalgia and interest for me. Plus, I wanted to play with “dodge and burn” in Photoshop, and I liked the effect better on the sepia. I don’t know why I’ve been so fascinated with flowers lately. If anyone were to stumble upon my blog right now, they’d think this was all I did. Which it isn’t. This weekend, the goal is to get some decent after dark art in Seattle. Must find new material…. This is gorgeous. 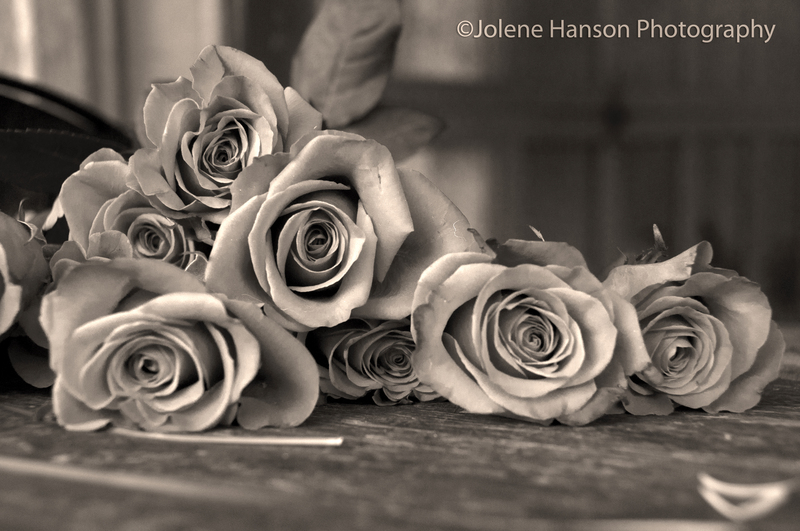 I’d never have considered converting roses to sepia/monochrome, really surprised how well it works. I like it – definitely more interesting than a standard flower shot. I think that you’re quite right in making this sepia colored… photos of red roses are a dime a dozen. Taking out the color takes the photo to an entirely different level. It’s gorgeous! The roses look really great with this processing and the patterns show up nicely from your POV. Great shot Jolene, I love the processing!